I’ve discussed a lot of different methods recently suggesting how to approach your spouse. Whether you try doing something different, altering the medium of your message, or rely on actions instead of words, sometimes nothing is quite as effective as the self-fulfilling prophecy to “Act As If”. Below I outline exactly how you can implement this in your marriage. Problems often arise in relationships because people think they can predict the future. ”I just know how my wife will respond when I tell her I’m going out,” or “Blake will undoubtedly fly off the handle when my parents come for dinner.” The problem with predicting dire outcomes in the future is that, whether we know it or not, we begin acting in certain ways that broadcast our expectations to our partners, and these subtle signals often bring about the very results we fear. When you expect failure and feel defeated before you approach a challenging sitation, it’s helpful to ask yourself how you woud handle the situation differently if you were expecting a positive outcome. How might your approach to your partner differ if you thought s/he would respond lovingly? Once you identify how your actions would differ under these circumstances, “act as if”; pretend you are expecting good things to happen and watch what happens. I’ll give you an example of a time I used “act as if” technique in my own life. Years ago, I had been away from home at a conference. I was gone for about five days. During that period, I called home every day to check on my husband, Jim, and my children. By day three, I could tell that Jim was getting tired of playing Mr. Mom. He grew less than friendly with each passing call. Upon arriving home, I was sitting next to a friend on the plane and as we pulled into the gate, I told my friend that I had a knot in my stomach. I assumed Jim – who was picking us up at the airport – wouldn’t be too happy to see me. Because I was expecting an icy reception, I told my friend I would cautiously allow Jim to set the tone for our greeting. I would keep a low profile, not be too effervescent, and certainly not let on that I had had a good time with my friends. My friend, who happens to be a therapist asked, “How would you greet Jim differently if you were expecting him to be happy to see you?” That was a no-brainer. I would get off the plane excited to see him, throw my arms aroudn him, kiss him, and start telling him about the conference and what happened there. I also would want to know about his time at home and how he was feeling. Now, contrast in your mind’s eye how differently Jim might have felt about these two different receptions! I decided to “act as if.” Even though I wasn’t confident that Jim was elated about my homecoming, I acted as if I thought he were. I greeted him exuberantly. And happily, within about ten seconds, I was sure I made the right decision. He was thrilled to see me and we had a great ride home together. How was I going to approach this situation given my pessimism? How would I like the situation to turn out instead? How would I handle this situation differently if I were expecting good things to happen? 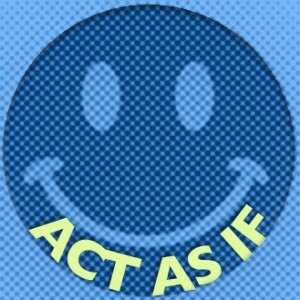 Then, regardless of how skeptical you might be about the possibilities of good things happening, “act as if.” Do all the things you would do if you were convinced of a positive outcome. Then watch the results. For a more visual explanation of Act as If, the video below is from my Marriage Breakthrough DVD package. Enjoy. This entry was posted in Uncategorized and tagged act as if, divorce, divorce remedy, how to approach spouse, infidelity, love divorce, marriage, Marriage Advice, marriage breakthrough, Michele Weiner-Davis. Bookmark the permalink. Hello Michele, I was wondering if you’ve done any presentations or written any articles on how to approach your husband and ask if he has been unfaithful. I don’t have any evidence, and I really don’t believe he has done anything but I still need to ask because I don’t know how exactly to trust others. Human beings are what they are, but am I being too suspicious? If I did ask him, how would I be able to tell if he’s concealing or lying? He has told me numerous times that his past relationship experiences are that women do the cheating and men are more faithful. He has also said that he has always been monogamous and that he’s a bad liar, that I would know if he cheated because he wouldn’t be able to look me in the eye. Well, the truth is that I’ve never been cheated on (I’m a walk-away type, always the one to leave but have only had about two long-term relationships; this one is my third [and last] attempt), so I have no idea what clues to look for if someone only does infrequent casual encounters.